The Super Soaker SoakerTag Elite: Arctic Shock is Hasbro's first entry into the ice-accepting soaker market. There have been other water blasters in the past (though none reviewed at iSoaker.com as of this posting) that were designed to accept ice-cubes into their reservoirs, but the Arctic Shock is the first soaker which comes with its own mould for creating an Icy-Core (basically, a large popsicle that fits into the main part of the reservoir). 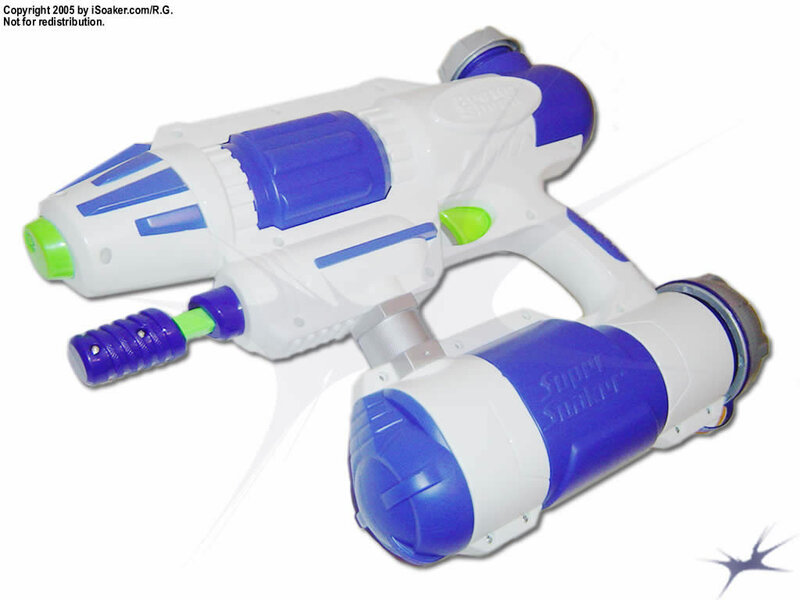 Otherwise, the Arctic Shock shares a similar design format to the Super Soaker Max-D Secret Strike and Super Soaker SoakerTag Elite: Flash Flood with its mostly-bottom-based reservoir, but only having the stream nozzle with no riot-blast. The Arctic Shock features a single nozzle powered by an air-based separate pressure chamber. The produce is solid, but its useful duration feels short due to a relatively limited firing chamber capacity. The firing chamber seems to have its opening closer to the back, thus requiring one to tilt the blaster slightly upwards in order to be sure one is expelling all the water from the chamber and reducing mist-shots. Thankfully, having a separate pressure chamber, the Arctic Shock can be pre-pressurized with air prior to loading the chamber with water to improve stream performance. However, the limited firing chamber capacity does restrict shot time. The pump for theArctic Shot is notably short. This is due to the choice of placing the trigger on the same level as the pump shaft on a blaster of this size. Not only is the pump short, but there seems to be a noticable lag in pumping, preventing one from pumping quickly. Attempting to pump faster results in creation of a partial vaccuum in the pump shaft since water seems flow-restricted when being pulled from the reservoir. This may be due in part to the longer intake tubing from the pump to the reservoir's intake (positioned near to the back of the reservoir). The trigger and grip area on the Arctic Shock has a good, relatively sturdy feel to them. The trigger has a slightly stiffer feel when pulling, but works well nevertheless. One potential problem is the limited space created in the grip area due to the blaster's bottom-mounted reservoir. While a good side, those with larger hands may find this area restricting and uncomfortable. Checking the feel of the blaster's grip prior to purchasing is always recommended for those on more limited budgets. Like the Super Soaker Max-D Secret Strike, the reservoir on the Arctic Shock is mounted below the firing chamber and trigger-grip areas. Due to this design, the blaster has a very nice balance to it even when filled since the additional weight of water in the reservoir naturally keeps the blaster upright. The reservoir also holds a good amount of water for a blaster of this size. Unlike the Super Soaker Max-D Secret Strike, the Arctic Shock has an additional reservoir area mounted behind the firing chamber that is connected to the bottom-mounted reservoir. This additional capacity was added likely due to the volume that is taken up by the Ice-Core (see below) if it is being used. As a complete Ice-Core would occupy a good amount of space in the lower reservoir, the additional capacity provided by the upper chamber keeps the available volume of liquid water respectable. As this soaker's name suggests, the Arctic Shock's selling point is its Ice-Core that acts to chill water in the blaster's reservor close to freezing point. The Ice-Core is a popsicle-type device that is inserted into the large, capped opening at the back of the bottom-reservoir. To create the Ice-Core, the Ice-Core's mould is filled to a marked fill-line with water, then the Ice-Core stem is inserted, and the whole unit is placed into a freezer until the water in the mould solidifies (basically like making a large popsicle). 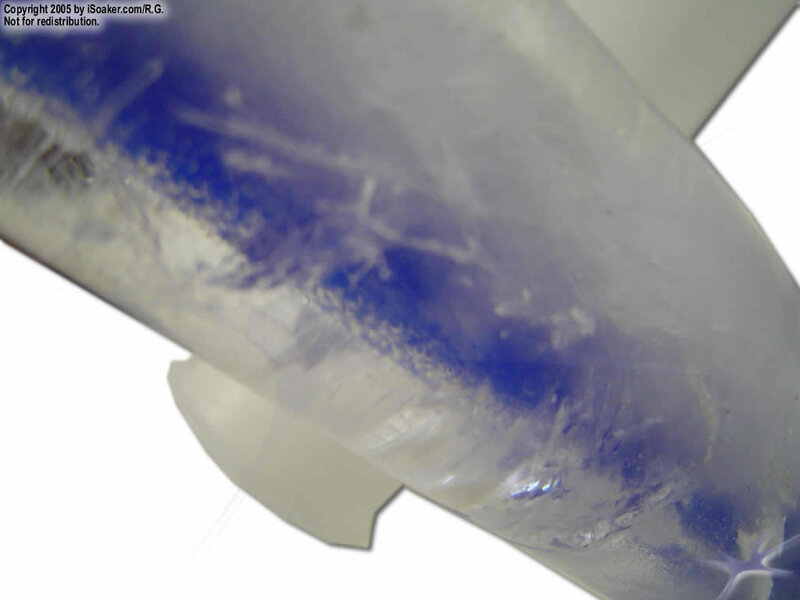 Once frozen, the mould is removed (aided by running some hot-water along the outside of the mould to release the ice off the inner walls) and the Ice-Core is inserted into the bottom reservoir. As the base of the stem is form-fitted with the opening of the reservoir, the Ice-Core ends up held suspended in the middle of the reservoir, maximizing the area of ice in contact with water. It is also nice that as the Ice-Core melts, it ends up contributing to the water availability in the reservoir. In the event the Ice-Core is not ready or already used, the large opening in the bottom-reservoir allows the insertion of most regular ice-cubes instead of the Ice-Core for cooling the contents. As noted above, the upper reservoir is directly connected with the lower one, thus the blaster can be filled with the Ice-Core in place (the Ice-Core's base mostly seals the opening). The speed at which the Ice-Core can chill the reservoir contents is quite good. The smaller firing chamber volume forces one to pump water from the reservoir more, but this means that water in the firing chamber has less chance to warm up to ambient temperature. The duration of the effectiveness of the Ice-Core depends on several factors from the temperature of water used to fill the reservoir as well as the general air-temperature and amount of sunlight warming the blaster. While the Arctic Shock's stream may not be as powerful as other known blasters, its icy sting makes opponents think twice prior to engaging. Getting hit by a particularly cold stream is rather startling to say the least. The main drawback is that once the Ice-Core has been used it, it would take some time to create another one. Ice-Core. Multiple Ice-Core moulds would be preferred such that replacement 'Cores could be on-hand when needed. 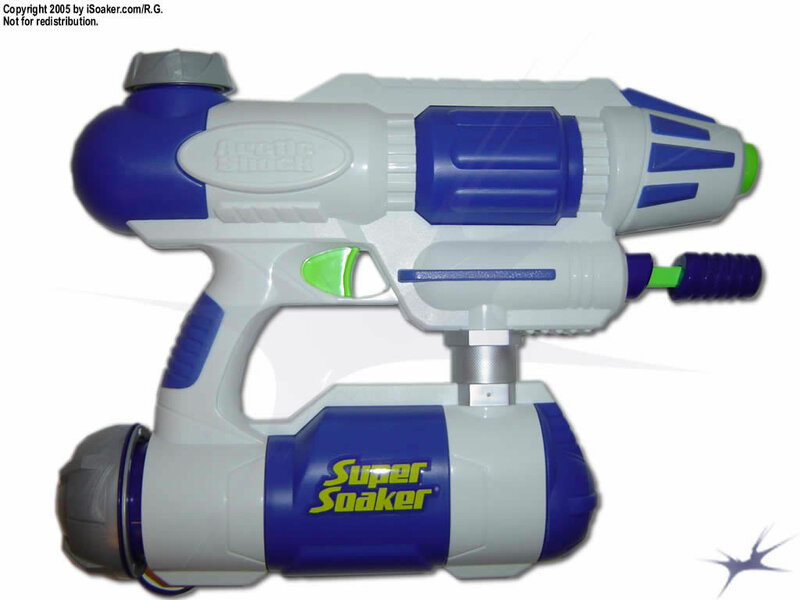 As a whole, Super Soaker SoakerTag Elite:Arctic Shock is a functional light-weight soaker. The main nozzle and firing chamber provide respectable power. The strengh of this blaster mainly lies in its ability to chill the water in its stream to a more 'shocking' temperature. However, its limited capacity and power restricts its overall functionality on the soaker-field. Capable of coping with most air-pressure-based soakers, the Arctic Shock would be easily overpowered by large air-pressure soakers as well as the majority of CPS and related types of blasters.. Effective cooling system to chill water streams. Fairly durable construction and decent feel. Good-sized reservoir. Small stream and firing chamber. Pump is short and seems to suffer from lag. Only one ice-core mould provided, thus time is needed to generate additional ice-cores once the initial one has melted. No strap. Well, I just picked up this blaster at the real Canadian superstore (guess were it's located. A: Canada) for 20$ Canadian, and while I wasn't expecting much, I was pleasently suprised! At a 60-70 degree tilt it shot 39 feet! (yes I put down measuring tape) It holds 1L of water, one third of the Aqua Pack's capacity. When I put in the ice core I waited for a little bit and then shot my hand. I was like WHOAH!!! That's cold!note: filling the blaster with ice produces a close result to the ice core. It's a light blaster with a quick refill time, but it only has one nozzle as with the other big blasters. (FF and APD) *Legal Disclaimer*: your definition of the big 3 may vary from mine, but this IS my review. It's a good defense blaster and good for 1 on 1 battles because when people feel that ice water they will most likely retreat. If not on sale a little pricey, the ice core is hard to get out of the plastic mould, the ice core can only be used once every 4-6 hours. Arctic shock deserves a 8/10 rating, if you see it on sale pick it up! (Based on emails from Ray) The pump grip is smallest on the Arctic Shock, the next biggest on the Flash Flood, then the Triple Shot is the largest of the 3, about the size of a MaxD 2000, but I like it because you can hold the entire pump grip in your hand. One noticeable difference also is that the pump stem is more sturdy than previous models which have stems that tend to bend and feel flimsy. Well these new models seem to have stems made of solid through plastic which will not bend. The Arctic Shock's pump stem is shorter than other models of its size but this gun still packs a good punch. This gun has one reservoir. The top part of the reservoir is just the back blue chamber which is connected to the bottom reservoir by the handle. When you load water through the top part, it just flows through the handle to the bottom part of the chamber until the water fills up to the top part. The bottom chamber noticebly has a larger opening. This cap is tethered to the gun. inside is a "removable core". This core has 2 parts: a sleeve and a sort of icicle pop stick. You'll remove the stick part, fill the sleeve with water, insert the stick into the sleeve, then freeze. Remove core from freezer, separate stick from the sleeve, and you have a icicle pop on a stick. You then place this "icicle pop on a stick" into the core chamber and close it up. Then load with water from the top part of the chamber. So see the water is cooled by simply by being around the icicle, which is about 6 inches long and 2 inches thick. (or you can just add ice). The Arctic Shock takes about 20 pumps to pressurize 100% and is based upon air pressure technology. The resevoir holds 40oz. I don't know if the ice core is effective at cooling the stream I havent tried it yet, I figured the only way to truly test that would be under ideal (summer) conditions. The overall balance of the gun feels good and I would rate the power at a little better than the Hydroblade. I tested the Arctic Shock by pressurizing the soaker then opening it. No water came out and it can still shoot. So as expected the blue chamber behind the nozzle must be a separate pressure chamber.